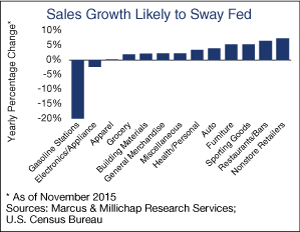 Retail sales expanded moderately in November, highlighting the strength of the U.S. consumer. Price-driven declines in gas station spending were offset by gains in online sales, food services and other discretionary spending categories, helping to allay any fears about a slowdown in the economy. The Federal Reserve’s decision to gradually raise the benchmark interest rate while watching for a buildup of inflationary pressure toward their 2 percent target will be supported by stable gains in this sector. Core retail sales, which omits volatile auto and gas spending, advanced 0.7 percent over the past year as consumers started shopping for the holiday season. Bright spots include additional purchases of items needed to form new households, such as home goods and furniture, as existing home sales and household formation continue to rise following an extended contraction during the downturn. Additionally, food services and drinking establishments posted substantial growth, up 6.5 percent year over year, as consumers feel better about their economic situations and spend freely in categories beyond the essentials. Gasoline station sales have fallen substantially over the last year as the drop in crude oil has filtered into retail gas prices, lowering consumer bills in the category. Less spending at the pump raises the prospects for improvement in retail sales over the coming months, particularly as consumers divert the savings from lower gas prices into purchases of other goods. Despite inexpensive gas throughout 2015, consumers have thus far opted to pocket the savings and pay down debt; however, the holiday shopping season and a strengthening labor market will likely support increases. Retail sales at restaurants and bars recently surpassed spending at grocery stores for the first time in history, highlighting the secular shift among consumers toward dining out more often, particularly as the economy has continued to expand. Retailers and investors alike have benefited from this trend, as eating establishments are often located near or in shopping centers, raising the flow of traffic to benefit other merchants. Rising retail space demand has fostered a 40-basis-point drop in vacancy over the past year to 6.3 percent. Internet sources, riding numerous Black Friday and Cyber Monday promotions, are boosting sales as consumers become more comfortable shopping online. Nonstore sales, which includes e-commerce, vaulted 7.3 percent year over year, outpacing all other retail categories. Industrial properties have benefited from a greater push by online merchants to offer expedited shipping times to consumers. The filling of space in major metros by these retailers contributed to a 60-basis-point vacancy drop to 6.5 percent nationwide thus far in 2015. An additional decline is likely in the fourth quarter. This entry was written by marcusmillichap, posted on December 18, 2015 at 6:59 pm, filed under Uncategorized. Bookmark the permalink. Follow any comments here with the RSS feed for this post. Post a comment or leave a trackback: Trackback URL.